Larry Knopp* began his career as Acting Principal Trumpet of the Edmonton Symphony Orchestra at the age of 20. 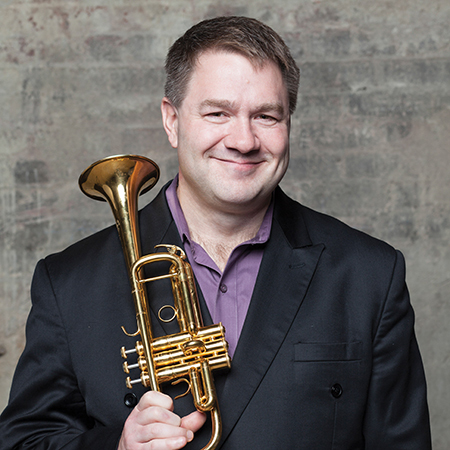 He has also held positions as Principal Trumpet with Orchestra London, the Hamilton Philharmonic, the CBC Radio Orchestra, as well as the Malaysian Philharmonic Orchestra, and is currently Principal Trumpet of the Vancouver Symphony Orchestra. Larry has performed and recorded with the Boston Symphony Orchestra, the New York Philharmonic, as well as the three tenors. Larry completed his Master’s degree at Northwestern University, where he played in the Chicago Civic Orchestra, and studied with Vincent Cichowicz. He has finished the academic work for his Doctoral degree at the Eastman School of Music where he studied with Barbara Butler. As an educator and conductor with a Bachelor of Education Degree, Larry has directed ensembles from junior high to university levels, and has recently finished appointments as visiting Professor of trumpet at the Eastman School of Music and the Northwestern University School of Music. Larry is active as a clinician throughout North America, Australia and Asia. As a faculty member at many summer festivals, Larry attracts numerous students to Vancouver, teaching at the University of British Columbia.